SUDDENLY this world has become different! It was never like this before. LOOK at the change in the last 70 years — then LOOK at the change in the last TEN. What will another 10 years be like — and WHAT by Century 21? When I was a boy, our family transportation was a horse and buggy. Horse-drawn streetcars had just been replaced with the little trolley-car "dinkeys." Telephones were rare, hanging on walls. Only a few downtown streets in cities were paved. Automobiles were a curiosity — we called them "horseless carriages." They were steered with a stick instead of a steering wheel. Gaslights dimly illuminated city streets. A man, riding horseback, rode past with a lighting stick to turn them on at dusk, and again to turn them off at dawn. Our home was dimly lighted by kerosene lamps. No man had ever flown. Orville Wright's first 12-second, 120-foot flight did not occur until after I was 4 1/2 months into my 12th year. Radio and television were unheard-of. And milk in cities cost five cents per quart. What About the Last TEN Years? Now look at the startling "advances" of just the last decade. They said MORE KNOWLEDGE would solve all the world's ills. So, in the last ten years the world's sum of KNOWLEDGE has doubled — mostly in fields of technology, electronics, medicine, and various branches of science. But the world's problems and troubles HAVE DOUBLED ALSO! In that same ten years! But look how ten short years have changed YOUR LIFE. It was not like this a single decade ago. TODAY-it is unsafe to walk on streets — in city or in town. Your house or apartment may be broken into if you're away. Crime now is rampant, even in residence areas. Student revolt — violence on campuses. Disheveled hippies lolling aimlessly about. Unhappy marriages — increasing divorce — juvenile delinquency. Family and home life, the FOUNDATION of any, flourishing civilization, falling apart. Police report more homicides in homes, due to family quarrels, than any other source. WHY this sudden breakdown of family life? Then there's mounting racial strife, mass demonstrations, riots, looting, widespread mass VIOLENCE. And threat of all-out world-girdling NUCLEAR WAR. Again I ask: WHAT will this world be like in another ten years? And what by Century 21? Scientists picture two opposite extremes ahead. 1) Science, technology and modern industry are teaming together to produce a magic push-button Disneyland dream-world for our near future. They plan to bring happiness to humanity by reducing work hours to an unheard-of minimum. Now they are talking about a six-hour day; a three-day work week; four-day weekends off work; three-to-four-month vacations; net incomes, after taxes, up to $50,000 (£19,000) per year; and retirement at age 49. They plan to make us all happy by producing a dazzling array of gadgets, labor-saving devices, amusement and entertainment mechanisms such as our wildest anticipations have not envisioned. And medical science plans to replace breaking down human organs to lengthen lives. 2) Conversely, other world-famous scientists see a far sterner picture of the future — one that reverts to the opposite extreme. They see — today — the starving masses of illiterates in India, China, Africa — more than half the world's population in the depths of ignorance, poverty, squalor and degradation; the population explosion and the coming food war; the breakdown of family life, the very BASIS of a progressive and thriving society; the spiraling increase in crime; the fast-spreading breakdown of law and order, and increasing widespread violence; the proliferation and stockpiling of nuclear weapons that can blast all life from this earth fifty times over; and then the mounting crescendo of strife and hostility between nuclear-power nations! All this they see, and view a future of gloom and doom and absolute hopelessness. They tell us humanity's one great problem, now, is the QUESTION OF SURVIVAL. Other scientists, educators and writers envision the next few years in this manner: The present trend will continue — only it will accelerate. The world will be as it is now, only more so! That is, more dazzling inventions for the few who can afford them; increasing millions of poverty-stricken, starving illiterates in backward areas; accelerating increase in the population explosion; increasing immorality, breakdown of marriages and family relationships; more crime; more race riots; increasing violence; more sickness and disease; more mental breakdowns; more unrest, distrust and tension between nuclear nations until they reach the breaking point. They see these worsening conditions speeding up. Ask these sober scientists HOW LONG we may continue in this present trend. Some will guess, perhaps ten more years — others think less than ten — some give us, perhaps, a little more. But that's only relative. It's still a question Of SURVIVAL! But humanity WILL SURVIVE! There is GOOD NEWS for the future. It is reported by a major news source most people — and most scientists — have utterly overlooked. There is a Master Plan already being worked out. And before Century 21, it will bring to this earth PEACE! There is a Master Plan to solve the vast problems of illiteracy, starvation, poverty and squalor. It entails vast agrarian reforms, economic reforms, reforms in governments, and practical plans to bring about disarmament and world peace. Many scientists and world leaders know, in general, what it will take to bring this solution. Today, many far-seeing leaders put their fingers on the one great change that can now save humanity alive. What they don't know is how to implement it. Sir Winston Churchill said: "A world super-government is the only solution to man's ills." Architect's dream — or nightmare? Will tomorrow's cities be overcrowded, honeycombed hodgepodges of bizarre architecture? God says, "Woe unto them that join house to house, that lay field to field, till there be no place, that they may be placed alone in the earth" (Isaiah 5:8). Said Dr. Charles E. Osgood, "What we need — and that most urgently — is world government." Others, as if with one voice, say the same. There is just one thing wrong with this solution — and it's the ONLY one advanced. That world super-government would have to be given the power of a world police force to enforce its laws, and it would have to maintain the ONLY military force in the world — all nations would have to surrender their armies, navies, and air forces to this one SUPER-STATE. In a word, every nation would have to surrender its national sovereignty absolutely. And WHAT MAN could be accepted by all as WORLD RULER? It would, mind you, be a world POLICE STATE. Would the Soviet Union give up its struggle to harness the whole world with Communism, and accept an American as their world ruler? No, I'm afraid not in a thousand years! Would the U. S. accept a Russian from the Kremlin? Or perhaps a North Vietnamese or a North Korean? NEVER! There is only one way the nations could get together on a world super-government. Within nations, each individual has to be willing to give up his personal sovereignty. He must submit to the laws of his government, or suffer the consequences. Of course, individuals in all countries are given certain personal liberties, not prohibited by law. So it must be with NATIONS — if there is to be a world super-government — if humanity is to survive! IF there is to be the world super-government Winston Churchill envisioned, all individual nations must first give up their private selfish goals, their dreams of world conquest — of spreading their particular kind of government around the world. One important news magazine said this can happen only if there is "a strong hand from someplace" that would intervene. All leaders are agreed the world's only hope is a world super-government. At the same time, all leaders confess frankly that world super-government is absolutely unfeasible and utterly IMPOSSIBLE! On this world leaders are agreed: The ONLY SOLUTION is IMPOSSIBLE! Isn't it just about time we heard some GOOD news for a change? Yes, there is, after all, a GREAT NEWS SOURCE the world leaders and scientists have left out of the picture. There is a major world news source most have over-looked. It reports tomorrow's news today! It reports world news before it happens! It's news of a gigantic MASTER PLAN for a world super-government. There is that needed "strong hand from someplace." You have to face it — either there is now no HOPE — either all humanity soon will be erased from this earth (to use an expression spoken by the late, U.S. President Eisenhower) — or there does exist that "strong hand from someplace" with supernatural power to INTERVENE in world affairs — to literally take control from the human Great Powers of this world and to SAVE humanity from itself! Every reader needs to wake up — and to realize this means YOUR LIFE — and the lives of your children, your family, your friends and neighbors. The one great problem facing every one of us is HUMAN SURVIVAL. And the only alternative to extinction — SOON — is world government — so say the leaders. I sat in the press gallery in the Opera House at the San Francisco Conference in 1945, when world leaders were drawing up the charter for the United Nations. There I heard the leading statesmen of the world warning that this United Nations they were forming was "THE WORLD'S LAST HOPE." One hour, in plenary sessions, they were uttering this solemn warning; the next hour in group conferences with leaders from other nations they were fighting savagely for their own special advantage. The United Nations has proved futile — except, perhaps, as a propaganda sounding board for the Soviet Union. There have been more than sixty wars scattered over the world, which the United Nations was impotent to stop, since 1945. The United Nations is NOT a super world government. Hiding your eyes from the existing facts won't save your world for you — and YOU alive in it! This directly concerns the life of every reader of TOMORROW'S WORLD-and the countless other millions who ought to be reading it. This is REAL! It's HERE! There isn't much more time! It's now far later than you think. And — yes, I realize it — this is the ONLY VOICE IN THE WILDERNESS of today's desperate situation that dares to SPEAK OUT! THIS YOU MUST FACE. There are now two alternatives — and ONLY two. 2) Any one of six existing causes will ERASE HUMANKIND FROM THE EARTH, possibly in this decade or the next — and most certainly prior to CENTURY21! First, notice the published report of the world's number one Newscaster. This newscast was a FORECAST. And it's CERTAIN. I know, very few ever realized that Jesus Christ came as a NEWS-man — reporting NEWS for the future. He spoke of twentieth-century world conditions — and WORLD GOVERNMENT to come. The world has misunderstood, perverted, maligned His Message. The word "gospel" means GOOD NEWS. And His was news for the FUTURE. He described today's violent chaotic world. In the pivotal prophecy of the New Testament of the world's best selling Book, He graphically described the international chaos into which the world is rapidly plunging right now. He said the violence would explode into a world trouble so great, that unless God intervened, no human would remain alive. Yet, He promised, the All-powerful God would intervene supernaturally to cut short this world chaos (Matt. 24:21-22). No book has so great a sale as the Holy Bible. No book ever was so misunderstood, maligned, distorted, misrepresented. Those who profess to use it as the source of their religion promulgate doctrines diametrically opposite from its teachings. They quote (or misquote) only a fraction of its verses. Few know that a whole third, approximately, of that Book is devoted to FUTURE NEWS of world happenings. News about various governments. News about the great MASTER PLAN for solving all this world's troubles. News of the now soon-coming peaceful and happy WORLD TOMORROW — on through CENTURY 21. It's the BEST NEWS you ever read! We look, now, at one pivotal NEWS DISPATCH within this volume, which covers dramatically a panorama of the dominating governments, past, immediate present, and future-on into CENTURY21. Incredible though it seems — and would — be discreditors to the contrary notwithstanding — the evidence has demonstrated conclusively that this world-news report was written between 500 and 600 years before Christ. It concerns the king of the first world-empire. His name was Nebuchadnezzar. His capital was the ancient glamor city and world capital, Babylon. One night this king dreamed a remark able and frightening dream as reported in Daniel 2. It was one of those rare dreams that remain indelibly impressed on the mind after awaking. He thought it must have meaning. Now among other nations that had been conquered by this great Chaldean king was the Kingdom of Judah whose capital city was Jerusalem. These Jews had been taken as captives and transported from their homes in their cities, towns and countryside to the land of the Chaldeans, where they were made slaves. But four outstandingly brilliant Jewish lads had been inducted into important government positions in Babylon. Among them was Daniel. The four Jewish lads prayed to their God for the answer. That night it was revealed to Daniel in a vision. Report on "What Is To Be"
"Are you able to make known to me the dream... and its interpretation?" asked the king when Daniel was ushered into his presence. "No wise men... can show to the king the mystery," replied Daniel,.. but there is a God in heaven who reveals mysteries, and he has made known to you what is to be. "You saw, O king, and behold, a great image. This image, mighty and of exceeding brightness, stood before you, and its appearance was frightening. The head of this image was of fine gold, its breast and arms of silver, its belly and thighs of bronze, its legs of iron, its feet partly of iron and partly of clay. As you looked, a stone was cut out by no human hand, and it smote the image on its feet of iron and clay, and broke them in pieces; then the iron, the clay, the bronze, the silver and the gold all together were broken in pieces, and became like the chaff of the summer threshing floors; and the wind carried them away.... But the stone that struck the image became a great mountain and filled the whole earth." But what did it MEAN? Its MEANING was a NEWS forecast leading to the present world turmoil, and its imminent and SURE outcome! It is NEWS that vitally affects the life of every reader of TOMORROW'S WORLD! "This," continued Daniel, "was the dream; now we will tell the king its interpretation. You, O king, the king of kings, to whom the God of heaven has given the kingdom, the power, and the might, and the glory...you are the head of gold. After you shall arise another kingdom inferior to you, and yet a third kingdom of bronze, which shall rule over all the earth." Here was NEWS of the future. It was news reported in advance. And it happened! After the Chaldean Empire, the Persian Empire arose. It was inferior as a world empire intellectually, morally, and in honor and splendor and glory — even as silver is LESS VALUABLE than gold. But, as silver is harder than gold, so was the Persian-Empire stronger in military might. Humanity was deteriorating. The Persian Empire fell before the swift conquering flight of young Alexander the Great, with his Greek and Macedonian army. Alexander expanded his empire farther east and west and south — greater in military strength, more in quantity — greater in area and population ruled — but inferior in quality, even as bronze is of less value than silver, yet a harder metal. Alexander wept because he had no more worlds to conquer. He died young in a drunken debauch. His empire was divided into four divisions, each ruled by one of his four top-ranking generals. "And," continued Daniel, "there shall be a fourth kingdom, strong as iron...." This was the Roman Empire, which swallowed up all four surviving divisions of Alexander's Graeco-Macedonian Empire, and spread out farther besides. It was the strongest military power in world history up to that time. And the two legs symbolized the two divisions of the mighty Roman Empire — with the eastern capital at Constantinople (today called Istanbul, Turkey), and the western capital at Rome. But Daniel continued: "And as the toes of the feet were partly iron and partly clay, so the kingdom shall be partly strong and partly brittle... but they will not hold together, just as iron does not mix with clay." There are three other specific prophecies — FUTURE NEWS REPORTS — one in the 7th chapter of Daniel, one in the 13th and one in the 17th of Revelation, which also depict the future NEWS of this same succession of world empires. Putting all four prophecies together, it becomes plain that the toes of this image represent a last, final resurrection — or rebirth — of the Roman Empire in our time! There is not space for details in this article. But the two prophecies in the book of Revelation report clearly — long in advance — the fall of the original Roman Empire in 476 A. D., its restoration by Justinian in 554, and its history as "the Holy Roman Empire," up to the fall of Napoleon in 1814. Then Revelation 17:8 shows the partial revival of this empire under Mussolini — after he took Ethiopia, adding it to Italian Somaliland, Eritrea, Libya and Italy — officially naming it "the Roman Empire." These prophecies depict detailed ADVANCED NEWS of one more, last, revival of this Empire, yet to occur, by a union of ten nations in Europe. This coming "United States of Europe" is the dream of many leaders — not only within Europe, but in Britain and America. The Common Market is its beginning. Every indication is that in possibly this decade or the next, this ADVANCE NEWS will be current news. And it will completely STUN THE WORLD! Yet The PLAIN TRUTH has reported this news in advance for the past 38 years! Once political-military union is achieved out of the Common Market in Europe — combining TEN nations — it will present before the world a THIRD POWER probably even stronger than either the U. S. or the U.S.S.R. But these nations will not cling long or loyally together. The ten toes of Nebuchadnezzar's image pictured millenniums in advance this United Europe. They will not cleave together for long, even as iron and miry clay will not. This prophecy — and others — give you the NEWS long in advance! Not by the help of men, or of their human governments — but in spite of them! Other prophecies report, centuries and millenniums in advance, almost every detail of today's rapidly worsening conditions. Few realize that 90 percent of Biblical prophecy pertains to OUR TIME, and the very few years immediately ahead. And approximately a third of the Bible is prophecy! It has been neglected utterly. It has been terribly misunderstood, misrepresented. It is tremendously important! Especially now! Jesus' "Gospel" (and remember "Gospel" means "Good News") was actually His ADVANCED NEWS REPORT of the KINGDOM — the GOVERNMENT — of GOD, soon now to bring us world PEACE. The KINGDOM of GOD is, simply, the world-ruling GOVERNMENT of God. It is absolutely not a sentimental, ethereal, imaginary something "set up in the hearts of men." It is something REAL! It is SOON COMING! And Jesus Christ was born to be the KING of that WORLD GOVERNMENT (Luke 1:30-33; John 18:36-37; Rev. 19:11-16; 11:15). As General MacArthur promised the Filipinos he would return, so Jesus promised His disciples He would return — and now, SOON, to RULE THE WHOLE EARTH! 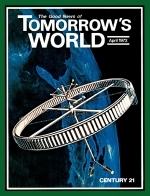 If the reader would like an exciting, graphic description of the coming WORLD TOMORROW — a world governed by the Eternal Creator God, a world under perfect divine rule, organization and direction — you may have, at no charge, for the asking, a full-color-illustrated booklet of 96 pages, The Wonderful World Tomorrow - What It Will Be Like?. It gives you many details. It gives you the system of organization — even THE NAMES of world-famous men who will occupy tremendous offices of power — the very names of men who will have executive rule over Britain, over the United States, over Russia, over Germany and others. It will describe the new world's system of education. It will name probable names of highly experienced men who will head the world's new monetary system, the building of gigantic new public works, the new agrarian reform. It will show how the race question will be settled IN PEACE, with all races happy — and prosperous. You've never read anything like it. It is absolutely amazing — and it pictures humanity's one great and sure hope.